Steve Kinniburgh was pleased with a “decent performance” as Corby Town guaranteed themselves a top-three finish in the Evo-Stik League South Division One Central with a 2-1 success at Aylesbury United. 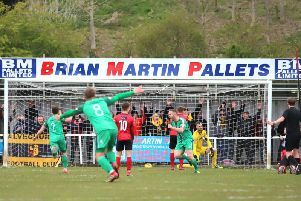 First-half goals from top scorer Elliot Sandy and Steve Diggin proved to be enough for the Steelmen, although the hosts hit back in the second half through Harry Jones. The victory means Corby, who have now hit 99 league goals this season, guaranteed themselves a home semi-final in the play-offs. And boss Kinniburgh said: “We went in 2-0 at half-time and we were on top of the game in the first half but there weren’t that many chances for either side. “In the second half we came out of the traps really well and that 100th goal of the season just wouldn’t go in. We had five or six chances to get it and it never came. “And, because we didn’t get it, they had half a chance and the ball looped in and gave them a goal and it put us under a bit of a pressure that we didn’t really need. The Steelmen can now look forward to a return to Steel Park next weekend when they take on Welwyn Garden City. Kinniburgh is hoping to have Northampton Town youngsters Camron McWilliams and Jack Newell available again after they missed the win at Aylesbury due to injury. But Kinniburgh revealed full-back Miles Smith’s season looks to be over due to a thigh injury. “The two boys who are on loan from Northampton missed out due to injury so I am hoping they will be back in contention next week,” the Corby boss added. “Miles is still struggling and I am not sure whether we will see him again this season, which isn’t ideal for him or us. “But other than that we are okay and we are looking forward to our last Saturday home game of the season.